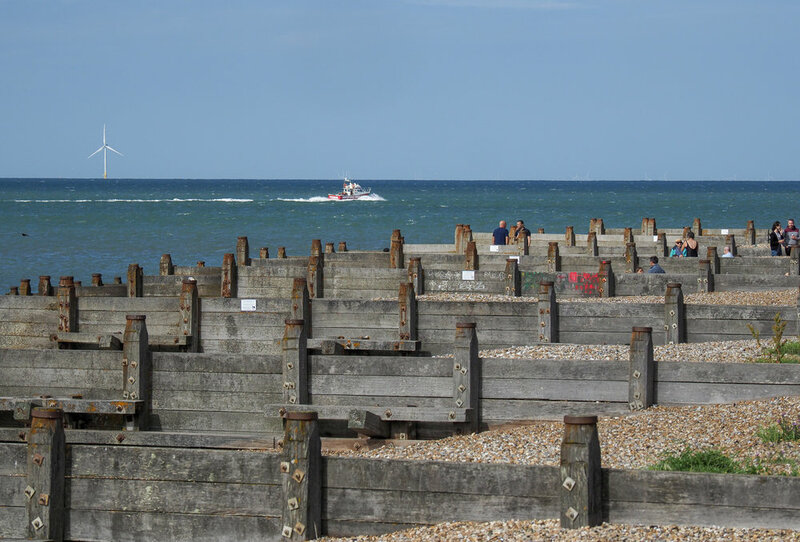 I have in recent years been fortunate to have visited several coastal towns and cities in the South East and South of England including Whitstable, Herne Bay, Margate, Broadstairs, Ramsgate, Deal, Dover, Hastings, Eastbourne and Brighton. I’ve experienced all but the ‘teeth-breaking sticks of rock’ Jeremy Calkin refers to. Margate and Broadstairs buck the pebbled beaches description though, having nice sandy beaches. If it were not for one of my daughters living in the UK, I doubt I would have ever seen much beyond London. And so it was, we set off by bus from Canterbury to Whitstable beside the sea, a return to a town I have previously visited and liked so much, it was always going to be lined up for another visit. The first time we walked to Whitstable via ‘The Crab and Winkle Way’, a 10km (6 mile) cross-country trail from Canterbury which follows the path of a former railway line through forest, agricultural and pasture land. That time it was bitterly cold in Whitstable. This time we took the easy option and that was a short bus ride on a summer’s day. Leaving Canterbury Bus Terminal, Whitstable bound. I do believe that when photography is a passion, it engenders an increasingly greater awareness of our surroundings. So it is with the seaside I have seen in England. Whitstable has a sort of salty industrial, unkempt look. There's an expansive pebbled beach divided regularly by endless ugly wooden breakwaters (as per image below). That view of the breakwaters is my subjective opinion. Others may think its the prettiest of beach structures. The boat harbour is a small industrial working port. Doesn’t sound like love at first sight but something strongly attracts me to this place and it is it's ‘old bones’. It's the history you can see and feel, and scenes like its beautiful beach houses along the esplanade. It’s also much different to home and those differences are what is wonderful about the British seaside and about travel in general. Coastal colour. Whitstable seafront homes. Whitstable was first recorded in the Domesday Book of 1086. Famous for its oysters, which have been harvested since Roman times and this was indeed a magnetic pull for me visiting again, having downed them on previous visits. It’s hard not to baulk at the price of nearly NZ$6 an oyster though! They really are a luxury. I never buy the famed Bluff oysters at home given the price and they are considerably cheaper by comparison. The Royal Native Oyster Stores, Whitstable. Whitstable Harbour bound 'Greta', a historic Thames sailing barge built in 1892 to transport cargo on the River Thames. Oh yes! Whitstable Oysters, North Atlantic Cod and Whitstable Lager. Whitstable town is a bustling picturesque place. I love that so many small independent characterful shops exist and appear to do well in the UK & Ireland. They don't appear to have been displaced by the big box corporates who have sucked the life from the high streets at home. The colour of life. The colour of Whitstable, Kent, UK. One of my favourite walks in Kent is the 5 mile coastal walk below stunning white chalk cliffs between Ramsgate & Broadstairs. Ramsgate was one of the great England seaside towns of the 19th century and has the distinction of being the only Royal Harbour in the United Kingdom. Because of its proximity to mainland Europe, Ramsgate was a chief embarkation point both during the Napoleonic Wars and for the Dunkirk evacuation in 1940. Beside the sea. So very British. Ramsgate, Isle of Thanet, Kent. Broadstairs just along the coast from Ramsgate is very much a seaside resort and everything about it mirrors my perception of the British seaside. Beach huts, colourful beach toy shops, deckchairs, ice-cream, amusement parlours, fish and chips. No doubt all very ordinary for a local but another out of the ordinary photographic opportunity for me. Charles Dickens visited Broadstairs from 1837 until 1859 favouring it as a holiday destination. He wrote David Copperfield while staying at Bleak House. Beside the seaside beside the sea on a glorious summer day. Broadstairs Beach, Kent, UK. Waiting for summer. Herne Bay, Kent. Visitors from Iceland. Whitstable, Kent.